Recipes are superfluous, at least initially. You need not put all options on the table, and least of all upon the dinner table. Simply remember what Mama told you. 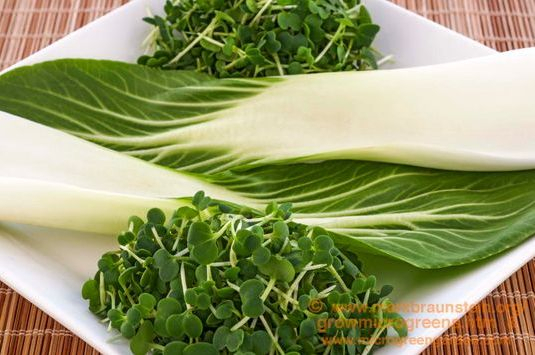 “Eat your greens.” Mama Nature instructs the same, and to eat them raw. Cooking destroys most types of phyto-nutrients, though not all types. Broccoli microgreens are lauded for being fifty times richer than full-grown broccoli in the specific anticancer phyto-nutrient sulforaphane. Fine and good. What often is omitted from mention in this comparison is that nearly everyone who eats broccoli eats it cooked, while nearly everyone who eats broccoli microgreens eats them raw. Cooking microgreens defeats your purpose for growing them local and fresh, as cooking renders them into mush. Use your teeth for mushing, because mastication keeps microgreens raw. Forget juicers, blenders, grinders, dehydrators, or any other appliance with an electrical cord. Save those for when you are old and decrepit and toothless. Until then, tell the tooth, the whole tooth, and nothing but the tooth. To assure you fully digest microgreens, you first must fully chew them. Nutritionists all agree, if upon nothing else, that we should fully chew our food. To fully chew microgreens, eat nothing else with them, and do nothing else but eat them. Turn off the radio, put away that magazine. But feel free to engage in meaningful conversation with your dinner companion. If you happen to be dining alone, consider your microgreens as your meal mates. After all, for the past week or two, they were your housemates. To savor their flavor, you need only one recipe. Call it a recipe for success, or for optimal nutrition. (Or do not even call it a recipe.) First, put aside your silverware or chopsticks, and eat with your fingers, so you can “feel your oats.” Second, closely inspect that cluster of microgreens you now hold “in the palm of your hand.” Next, place them into your mouth and begin to chew. Some nutritionists recommend to chew every mouthful of food at least 15 times, others advise 25 times. One sage of salivation suggests you should chew 150 times … if you do not first fall asleep. But who’s counting? Instead, play the children’s game of “open your mouth and close your eyes.” Spared from visual distractions, you will see how easily you can concentrate on every mouthful, and will chew with greater awareness of the taste and texture of every morsel. In this way, you will fully appreciate your microgreens, and fully savor their flavors. And if you ever tire of eating microgreens, you sooner will tire of growing them. More important then our mere counting, we humans aspire toward an accounting. Growing microgreens ultimately is all about eating microgreens, and we humans have much to learn about how and what to eat. “What’s for supper, Mom?” is a short question with a long history of many answers, some of them dead wrong. If you learn nothing else from these instructions about and contemplations upon a truly mundane subject, please ponder these three simple words: Every Mouthful Counts. 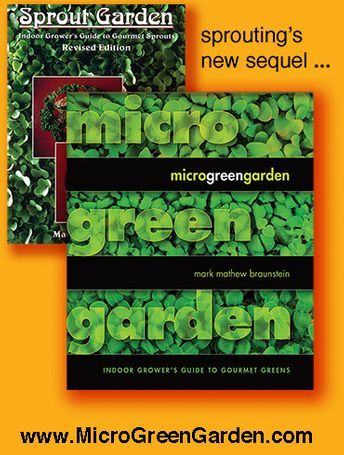 Microgreens are very new foods about whose cultivation and nutrition we still have much to learn. Despite potential obstacles, your labors surely will reap the paired rewards of both sustenance and abundance. You do not need a green thumb to achieve fruition. Even a pink pinky will suffice. But you do need patience and persistence. Tending to your microgreens will be a joy, not a chore. Grow them knowing that you are being good to them, and thank them knowing that they will be good for you. May your future be filled with microgreens, and may all your harvests be nourishing and bountiful and beautiful!